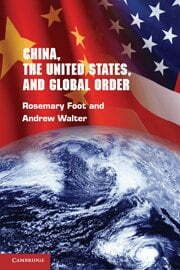 In this new book, British scholars Rosemary Foot and Andrew Walter attempt to identify the factors that shape Chinese and American behavioral consistency (or lack thereof) with global governance norms and structures. They compare U.S. and Chinese compliance with five sets of norms: the non-use of force except in self-defense and the responsibility to protect, international macroeconomic surveillance regarding exchange rates, nuclear non-proliferation, climate change, and global financial regulatory norms. According to the authors, three factors determine the extent of behavioral consistency: the level of domestic social and political significance, the degree of procedural legitimacy and material distributional fairness, and the distribution of power. With conceptual sophistication and empirical richness, the authors are able to demonstrate that China’s compliance has increased as its economy has become more interdependent with the rest of the world, although in selective ways that reflect particular economic and security interests. Although the United States created the initial institutions, it has performed inconsistently, unable to rein in important domestic constituencies that have an interest in seeing certain norms violated. As a result, the authors were able to weave together three broad issues in one volume: global governance, great-power politics, and international regimes. This is a book about liberal international order. Central focus is on the order created by the United States in the aftermath of World War II; how did this liberal project unfold, what are the core characteristics of it in comparison to other varieties of order, how is the order challenged today, and what are its future prospects? Ikenberry is fundamentally optimistic; the crisis of the current order is a crisis of success, not of failure. The substance of liberal international order—an open and loosely rule-based system—is not in question. The crisis is one of authority, of roles and rights within this order. It follows that liberal international order has a potentially bright future provided that the United States—which continues to be the supreme constructor of liberal order—devotes itself to a grand strategy focused on liberal order building. I find much to agree with in Ikenberry’s masterful analysis, but I also argue that the book is too optimistic on behalf of liberal order and that the problems besetting it run deeper than a mere crisis of authority.